The Greek letters ΦΒΚ stand for “The Love of Learning is the Guide of Life.” This is a fitting maxim for our nation’s oldest academic honor society. The DC Area Phi Beta Kappa Association believes in passing our passion for knowledge and its enrichment on to younger members of our communities. Since 1974 DCPBK has sponsored a High School Awards Program to encourage excellence, creativity, and industry among the diverse student population attending the public and charter schools in our area. 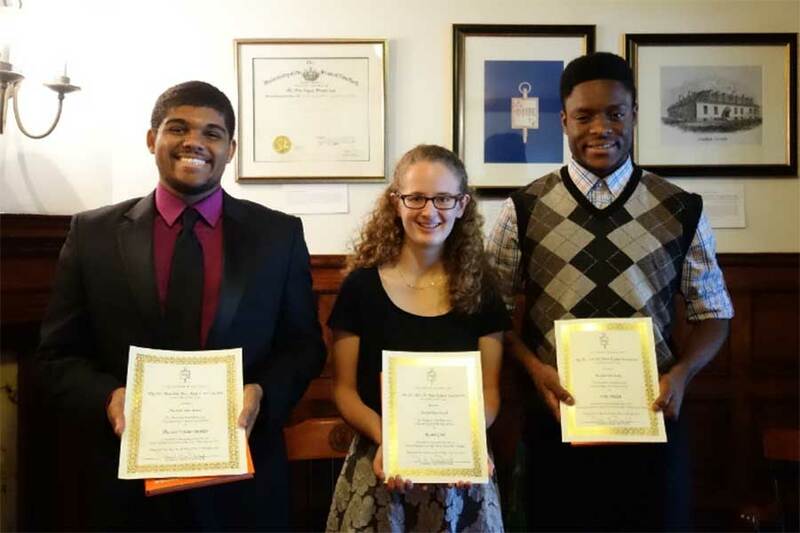 Every year our members select deserving high school seniors in the District and nearby Virginia and Maryland to recognize their scholastic achievements and community service. This Program has become the centerpiece of the Association’s commitment to our community, and in recent years DCPBK has offered up to three awards to college-bound seniors of $1,000 each. Contributions to the High School Award Program from our members and supporters are gratefully received. 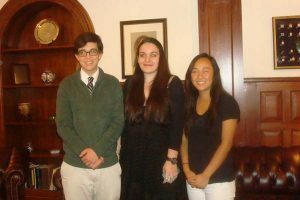 Honorees are recognized at a reception each May and are presented with a book pertinent to their future course of study as well as a Phi Beta Kappa Certificate of Recognition. This year, we are honoring our distinguished late colleague and Past President with a special Ambassador Andrew L. Steigman Merit Award to be presented at the High School Awards ceremony in May 2019. Please join us in honoring his memory with a contribution by clicking the “Support the Awards Program” button at the bottom of the High School Awards page. In 2018 Ambassador Miriam (“Mimi”) Hughes served as our featured speaker. For 32 years she was a member of the Foreign Service of the U.S. Department of State, and became the seventh U.S. Ambassador to the Federated States of Micronesia in 2007. 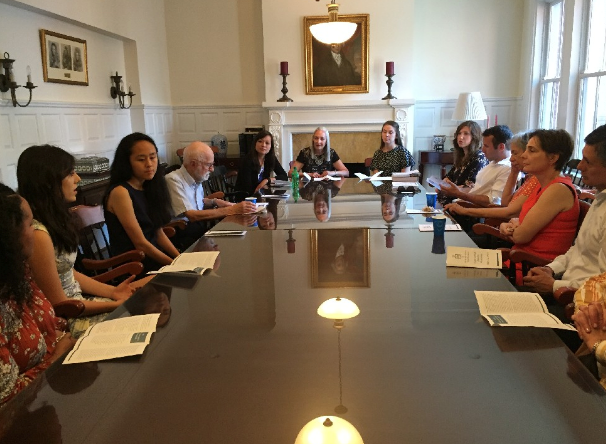 In addition to fascinating insights on the Foreign Service, Mimi gave our award winners and other attendees helpful advice on “following one’s compass” when navigating life’s challenges and balancing competing priorities. The full text of her speech can be found here. To apply for our 2019 award, please fill out the application in PDF or Word format, attach electronic or scanned copies of a recent transcript and either SAT or ACT scores, and submit all materials electronically to Mackenzie Fusco, High School Award Committee Chair, at Awards@dcpbk.org. Applications must be sent by 11:59 PM on April 5, 2019. The student receiving our award must show a commitment to the values and mission of Phi Beta Kappa, including academic achievement, community involvement/service, and a dedication to the liberal arts and sciences. Upon selection, D.C. PBK will ask each recipient for a letter of acceptance from his/her chosen college or university. Note: Applicants must have a 3.5 unweighted GPA to apply. Lauren Espinoza is from Rockville, MD, and attended Montgomery Blair High School. She served as team leader for the FIRST Robotics Competition Team 449 and was a research intern for the National Heart, Lung, and Blood Institute where she analyzed single- photon emission computed tomography (SPECT). Lauren was active in the Keep America Beautiful Youth Advisory Council, Montgomery County Commission on Children and Youth, and the Girl Scouts. She attends Harvard University and plans to study both economics and Near Eastern languages and civilizations in preparation for law school. Sheyda Tribble is from Washington, DC, and was dually enrolled at School Without Walls and The George Washington University (GWU) Early College Program. On campus, Sheyda was an anchor on a political radio show for the student- run station WRGW and an active member of GWU’s NAACP chapter. She is an active photographer and poet and recently self-published her own book of poems, Adolescence: Poetry and Musings of a Young, Black Girl. She attends Northwestern University and studies economics and international studies. Sherry Xie is from Falls Church, VA, and attended Thomas Jefferson High School for Science and Technology (TJHSST). She founded, developed curriculum for, and taught an introductory computer science and animation camp for elementary to high school students. Sherry was team captain for TJHSST Cross Country and Indoor Track and is a four-year TJHSST Varsity Soccer player. Sherry has served as Student Government Association Vice President (17-18), Treasurer (16-17), and Class Treasurer (15-16). Sherry attends Harvard University and studies government, economics, and computer science. David Edimo is from Silver Spring, Maryland, and attended Richard Montgomery High School. As President of the Montgomery County Regional Student Government Association, he assembled the most diverse executive board in recent memory by applying lessons learned in his IB anthropology class to value varied manifestations of merit. He also lobbied for a bill requiring suicide awareness training for school staff and, as a member of the Montgomery County Commission on Children and Youth, created and chaired the Access to Mental Health Resources Committee. David attends Yale College. Abigail Koerner is from Washington, DC and attended Woodrow Wilson Senior High School. She worked as a Peer Educator for three years at the Young Women’s Project, a non-profit organization dedicated to sexual health education, and as an advocate for issues like health education standards in public schools. She was Vice President of her school’s Best Buddies program and helped establish a tutoring program to increase DC elementary school student reading levels. Abigail attends Harvard College. Ava Sharifi is from Chantilly, Virginia, where she attended Chantilly High School. She was captain of her school’s debate team and Under-Secretary-General of her school’s Model UN team. An active volunteer in her community, Ava has served as president of the Key Club, debate coach at Rocky Run Middle School, and intern for several political campaigns. Ava attends the University of Chicago and majors in economics and comparative literature with a minor in Russian. Brian Contreras of Washington, DC attended the School Without Walls. Brian is an Eagle Scout, whose many enthusiasms include WorldQuest, a national trivia competition on foreign and domestic policy; former student representative to the DC State Board of Education; and a former lab assistant position at the Carnegie Institute of Sciences. Brian attends Stanford University and studies political science, public policy, and journalism. Nadja Zakula-Kostadinova attended TC Williams High School in Alexandria, Virginia. She tutored other students in the school Writing Center, was active in the Lawyer’s Club, and pursued an internship at the county courthouse. Nadja has received numerous science awards, particularly in botany. She now interns for the Commonwealth Attorney’s Office, and helps to edit the Smithsonian Museum of Natural History’s newsletter. Nadja attends New York University, and plans to be a doctor focusing on global public health. Joyce Zhou, from Boyds, Maryland, attended Northwest High School in Germantown. Her involvements there included an afterschool enrichment program in the sciences for elementary school students. Joyce is a member of the Rho Kappa Honor Society (Social Studies), Spanish Honor Society, Forensics Honor Society, and the National Honor Society, where she served as Vice President of Service. She attends the University of Maryland’s Honors College, and plans to pursue a career in international relations. Rachel Gold from Rockvillle, MD attended Richard Montgomery High School. While at Richard Montgomery, she served as editor-in-chief of The Tide student newspaper. She also ran cross-country and track all four years including on the varsity team in junior and senior years. She attends Brown University, where she studies history and plans to potentially pursue a career in journalism, or as a speechwriter, or in government service. Uche Medoh from Upper Marlboro, MD attended The Academy of Health Sciences at Prince George’s Community College. He attends Yale University, with a major in Cellular, Molecular, and Developmental Biology. Uche plans to become a doctor and biomedical researcher, where he hopes to apply his passion for the sciences in a charitable way. He has volunteered at the National Air and Space Museum, and has completed summer internships at the National Institutes of Health and at the University of Maryland. Thomas Walter Booker from Washington, DC attended the Duke Ellington School of the Arts. Since 2012, he has performed in more than ten plays, at such venues as the Kennedy Center, the Folger Shakespeare Theatre, Ford’s Theatre, and the Duke Ellington School. He has trained during summers at the Rutgers Summer Acting Conservatory and the British American Drama Academy Conservatory. He attends SUNY Purchase, where he is pursuing a career in theater education. The High School Awards program is made possible by generous financial contributions from our members and supporters. In the past, the program has benefitted greatly from the commitment of members like Mary Corinne Rosebrook, who served on the High School Awards committee until 1989, and was still tutoring young D.C. pupils upon her 100th birthday in 1993. Another important supporter was Ruth Knee, who dedicated significant time and energy to ensure the success of the program until her death in 2008. 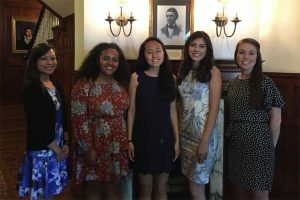 More recently, a longstanding member of DCPBK has included a substantial legacy endowment to the High School Awards Program in her will in order to secure its future income. Questions can be directed to treasurer@dcpbk.org. Contributions of $50 or more will be recognized in our awards ceremony program. Legacy donations and endowments are also welcome. Please contact the Treasurer about crafting an expression of your future gift. Information collected from applicants to the High School Awards Program will only be shared with the permission of the applicant. Applicants who are selected for the award will be contacted for photos and testimonials for our website and newsletter. Applicants will not receive other emails or solicitations of any sort. Any questions can be directed to awards@dcpbk.org.